Never one to shy away from controversy, Activision has unveiled a site asking players to sign on for a beta test of the Call of Duty Elite service. The service, which will launch in earnest alongside Call of Duty: Modern Warfare 3 this November, offers fans the opportunity to pay a monthly subscription fee for access to exclusive swag including in-game items, maps, and a host of social networking features. The site itself is pretty self-explanatory. In exchange for an email address, console preference and date of birth, Activision promises to add your name to a "closed beta invite list." Disregarding the firm's nebulous definition of "closed beta," it's nothing you haven't seen before, if you're at all familiar with how gaming betas work. The baffling/hilarious bit is that this site would appear less than 24 hours after the Call of Duty Elite service was announced. Reaction to the plan ranges wildly, from resigned indignation to dumbfounded amazement at the sheer cajones exhibited by the perceived cash grab. I think I have yet to witness anyone actually pleased by the idea, but I'm sure that exists somewhere. The introduction of this beta website, also raises another important question: how does Activision intend to beta test its Call of Duty Elite service without its companion game? 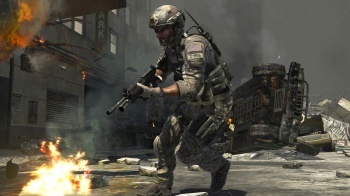 Will gamers be compiling data on Call of Duty: Black Ops, or will those admitted to the beta be playing Modern Warfare 3 well before the rest of us?